The multinomial theorem is a useful way to count. The counting problems discussed here are generalization to counting problems that are solved by using binomial techniques (see this previous post for an example). Seven dice are rolled. Find the probability that at least 4 of the dice show the same face. The solution in the previous post uses the binomial distribution. Binomial solution is possible because in rolling 7 dice, one and only one face can appear 4 or more times. So in this example, there are just two categories to keep track of in rolling a die – is it the value x or a value other than x. Use the binomial distribution to count these possibilities. Then multiply by 6 to get the answer. If we roll 8 dice instead of 7 dice, this method cannot be used. There can be more than two categories to keep track of. For example, in rolling 8 dice, it is possible that two faces can show up 4 times (e.g. face 1 showing up 4 times and face 2 showing up 4 times). So this is a multinomial counting problem instead of a binomial counting problem. We demonstrate how multinomial theorem is used to do the counting. Before we do so, we observe that the more dice are rolled, the higher the probability of having at least 4 of the dice showing the same face. As an extreme example, if we roll 100 dice, it is certain that at least 4 of the dice will show the same face. In fact, in rolling 100 dice there is a 100% chance that at least 34 of the dice show the same face. Here’s the problem. Eight fair dice are rolled. Find the probability that at least 4 of the dice show the same face. Let’s focus on one specific outcome in rolling 8 dice. The above outcome means that 4 dice show the value of 1, 2 dice show the value of 2 and 2 dice shows the value of 3. The number of ways this can happen is a multinomial coefficient. The outcome (4, 2, 2, 0, 0, 0) is one example of 4 dice showing 1 value, 2 dice showing another value and 2 dice showing another value. The above multinomial coefficient says that there are 420 ways the outcome (4, 2, 2, 0, 0, 0) can happen when 8 dice are rolled. In fact, the outcome (0, 0, 0, 2, 2, 4) – 4 dice shows the value of 6, 2 dice show the value of 5 and 2 dice shows the value of 4 – also associates with 420, that there are 420 ways this outcome can happen. The two outcomes (4, 2, 2, 0, 0, 0) and (0, 0, 0, 2, 2, 4) share something in common. That is, 1 of the value of the die appearing one time, 2 values of the die appearing two times, and the remaining 3 values of the die not appearing at all. How many ways can the 6 values of the die permute in this way? The answer is another multinomial coefficient. Multiplying the two multinomial coefficients together gives the number of ways, in rolling 8 dice, the result “4 dice shows one value, 2 dice show another value and 2 dice shows another value” can happen. Let’s summarize what we have done so far. We start with the outcome (4, 2, 2, 0, 0, 0), which is short hand for 4 of the dice showing the value of 1, 2 of the dice showing the value of 2 and 2 of the dice showing the value of 3. The number of ways this can happen is 420, which is the multinomial coefficient calculated in (1). The multinomial coefficient calculated in (2) is the number of the 6 positions (6 values of the die) can permute according to the criterion: 1 of the values appearing one time, two of the values appearing two times each and three of the values do not appear at all. The product of (1) and (2) is the number of ways 4 dice show one value, 2 dice show another value and 2 dice show another value when rolling 8 dice. The multinomial counting process discussed here is a double application of multinomial coefficients, with the first one on the rolls of the dice and the second on on the 6 values of the die. The key in solving the full problem is to list out all the different outcomes in addition to (4, 2, 2, 0, 0, 0). The following is the listing of all the possibilities. The table shows 12 possible outcomes. Note that the outcome (4, 2, 2, 0, 0, 0) discussed in the preceding section is outcome B in the table. The first 11 items in the table are outcomes that have only one face showing 4 or more times. The last item is the outcome that has two faces showing 4 times each. As shown in the preceding section, we calculate two multinomal coefficients and multiply them together. The first multinomial coefficient, as demonstrated in (1), is the number of ways the particular outcome can happen. The second multinomial coefficient, as demonstrated in (2), is the number of ways the 6 values of the die can permute similar to that specific outcome. The following table gives the calculated results. When rolling a 8 fair dice, there is roughly an 18.33% chance that at least 4 of the dice showing the same face. To reinforce the concept of using a double application of multinomial coefficients, it is a good idea to work a practice problem. Naturally, we can just up the dice count by one. Here’s the problem: Nine fair dice are rolled. Find the probability that at least 4 of the dice show the same face. The answer is based on a total of 16 outcomes. The practice problems presented here deal with a discrete joint distribution that is defined by multiplying a marginal distribution and a conditional distribution – similar to the joint distribution found here and here. Thus this post provides additional practice opportunities. Let be the value of a roll of a fair die. For , suppose that has a binomial distribution with and . Compute the conditional binomial distributions where . Calculate the joint probability function for and . Determine the probability function for the marginal distribution of . Calculate the mean and variance of . Calculate the backward conditional probabilities for all applicable and . Problems 7-A to 7-D are similar to the ones in this previous post. Calculate the mean and variance of . Calculate the mean and variance of (use the methods discussed here). Calculate the covariance and the correlation coefficient . Problems 7-E to 7-G are similar to the ones in this previous post. This post provides practice problems to reinforce the concept discussed in this post on transformation of univariate distributions. In each problem in this post, a pdf for the random variable is given and a transformation is given where is a one-to-one function. The problem is to obtain the pdf of the transformed variable as well as to calculate probabilities regarding . Find the pdf of . Determine the mean and variance of . Determine the 75th percentile of . Suppose that the random variable follows an exponential distribution with the following pdf. Determine the 90th percentile of . The random variable has a pdf that is given below. Determine of pdf of . Determine of CDF of . Calculate the probabilities where . Suppose that follows a uniform distribution whose pdf is given by the following. Let where is a positive constant. Determine the pdf of . Consider the random variable whose pdf is given below. Suppose that has the following density function. Suppose that the pdf of the random variable is given below. Creating new probability distributions from old ones (or existing ones) is a familiar theme in the study pf probability. This post shows how to generate a distribution under a transformation. The process is illustrated with examples. Practice problems are found in the next post. The starting point is the random variable whose probability density function (pdf) is given by the following. We demonstrate how to derive the pdfs of these four new random variables based on the pdf given at the beginning. Note that the support of is the interval . Because of the transformations, the supports of the variables are different. The support of is the interval . The support of is also . The support of is . The support of is also . There are two ways to derive the pdfs of , . One way is the CDF method: to find the CDF of the new variable and then take the derivative to get the pdf. Another way is the method of transformation, which is the focus here. We show how to use CDF method on in order to draw out the idea of the method of transformation. The and be the pdf and CDF of . Let be the CDF of . The following derives . Thus the CDF is the CDF evaluated at . Since pdf is the derivative of the CDF, the pdf is obtained by taking derivative of . The step that is labeled with * is the key step in the derivative and will be discussed in further details. Let’s describe the method demonstrated in the above derivation. There is a starting probability distribution represented by the random variable . Its pdf is whose support is a subset of the x-axis, likely an interval (of finite or infinite length). Let’s call the support . The support of a pdf is the set of all such that . We have a differentiable function defined on . This function is a one-to-one function over the support . 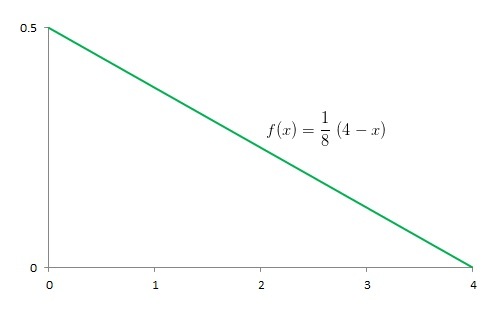 The function does not have to be a one-to-one function over all of the x-axis. It just has to be one-to-one over the support . As a result, the function is either an increasing function or a decreasing function over the support. Since is a one-to-one function, it has an inverse . The inverse is defined over the set . Consider the new random variable . The following gives the pdf of . The formula (1) gives the method of transformation and is illustrated by the step labeled with * above. With , the transformation is the function . It is not a one-to-one function over the entire x-axis but it is a one-to-one function on the support . In fact, is an increasing function over . The inverse function is then . Applying (1) gives the pdf . One thing to keep in mind is that the method works only if the transformation is a one-to-one function over the support of the original pdf (either is increasing or decreasing). If not, the method will produce a wrong answer. Another thing to keep in mind is that when the transformation is a decreasing function, its inverse is also a decreasing function. Then its derivative would be negative. In (1), we use the absolute value of the derivative. Using the method of transformation, the following shows the pdfs of , . It will be instructive to examine the graphs of the pdfs. The following is the graph of the pdf of . The starting pdf (Figure 1) is a straight line with negative slope. In this distribution, more probabilities are found near zero. For example . About 44% of the values from this distribution are expected to be less than 1. The following is the graph of the pdf of . Figure 2 shows that the effect of the transformation is to push the probabilities further to zero. The 44% that is less than 1 in Figure 1 is further pushed toward zero. Hence the graph in Figure 2 is extremely positively skewed (or skewed to the right since the right tail is longer). The following is the graph of the pdf of . Figure 3 shows that the effect of the transformation is to push the probabilities in the opposite direction toward 4. The hence the distribution of is extremely negative skewed (or left skewed since the left tail is longer). The method of transformation is a great tool making it possible to create new distributions with desired characteristics from old ones. Some named distributions are generated from transformation. For example, the lognormal distribution is a transformation from the normal distribution where the transformation is an exponential function. More specifically, if has a normal distribution with mean and variance , then has a lognormal distribution and parameters and . The transformation goes the other way too. If has a lognormal distribution and parameters and , then has a normal distribution with mean and variance . See here for a discussion of lognormal distribution. Practice problems on lognormal distribution are found here. 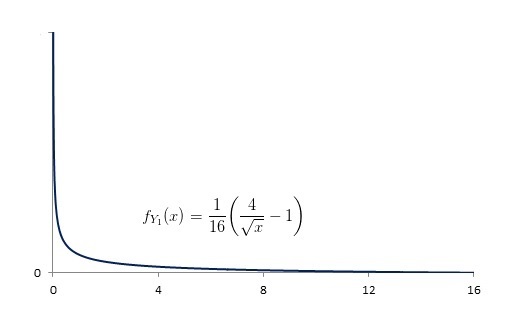 Another named distribution that is generated from a transformation is the Weibull distribution. 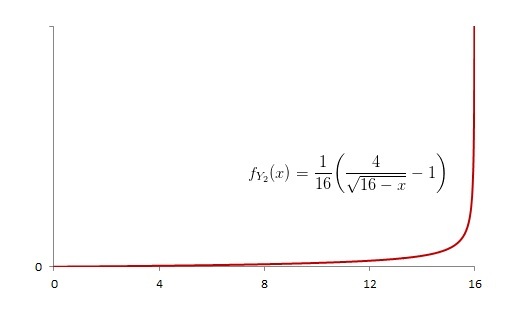 It is generated by raising an exponential random variable to a power (discussed here). The topic of raising an exponential distribution to a power is further discussed here. For more distributions created by transformation, explore to the site in the given links. This post provides practice problems to reinforce the concept of bivariate normal distribution discussed in two posts – one is a detailed introduction to bivariate normal distribution and the other is a further discussion that brings out more mathematical properties of the bivariate normal distribution. The properties discussed in these two posts form the basis for the calculation behind the practice problems presented here. The practice problems presented here are mostly on calculating probabilities. The normal probabilities can be obtained using a normal table or a calculator that has a function for normal distribution (such as TI84+). The answers for normal probabilities given at the end of the post have two versions – one using a normal table (found here) and the other one using TI84+. Suppose that and follow a bivariate normal distribution with parameters , , , and . For , determine the mean and standard deviation of the conditional distribution of given . Determine , the probability that given . Determine , the mean of the conditional distribution of given . Determine and , the variance and the standard deviation of the conditional distribution of given . For each of the values 6, 8, 10 and 12, determine the 99.7% interval for the conditional distribution of given , i.e. is three standard deviations below the mean and is 3 standard deviations above the mean. For each of the values 6, 8, 10 and 12, determine . Explain the magnitude of each of these probabilities based on the intervals in 6. Let and have a bivariate normal distribution with parameters , , , and . Determine the following. Determine the 5 parameters of the bivariate normal random variables and . Suppose is the height (in inches) and is the weight (in pounds) of a male student in a large university. Furthermore suppose that and follow a bivariate normal distribution with parameters , , , and . What is the distribution of the weights of all male students what are 5 feet 11 inches tall (71 inches)? For a randomly chosen male student who is 71 inches tall, what is the probability that his weight is between 170 and 200 pounds? For male students who are 71 inches tall, what is the 90th percentile of weight? Suppose that and have a bivariate normal distribution with parameters , , , and . Further suppose that . Determine . When , 4 values of are observed. Compute where is the mean of the sample of size 4. Let and have a bivariate normal distribution with parameters , , , and . Determine the following probabilities. For a couple from a large population of married couples, let be the height (in inches) of the husband and let be the height (in inches) of the wife. Suppose that and have a bivriate normal distribution with parameters , , , and . For a randomly selected wife from this population, determine the probability that her height is between 68 inches and 72 inches. For a randomly selected wife from this population whose husband is 72 inches tall, determine the probability that her height is between 68 inches and 72 inches. For a randomly selected couple from this population, determine the probability that the wife is taller than the husband. The annual revenues of Company X and Company Y are positively correlated since the correlation coefficient between the two revenues is 0.65. The annual revenue of Company X is, on average, 4,500 with standard deviation 1,500. The annual revenue of Company Y is, on average, 5,500 with standard deviation 2,000. Calculate the probability that annual revenue of Company X is less than 6,800 given that the annual revenue of Company Y is 6,800. Calculate the probability that the annual revenue of Company X is greater than that of Company Y given that their total revenue is 12,000. Normal with mean 163.8 and standard deviation . This post extends the discussion of the bivariate normal distribution started in this post from a companion blog. Practice problems are given in the next post. and finally is the correlation coefficient of and . So the five parameters of a bivariate normal distribution are the means and standard deviations of the two marginal distributions and the fifth parameter is the correlation coefficient that serves to connect and . If , then and are simply two independent normal distributions. When calculating probabilities involving a bivariate normal distribution, keep in mind that both marginal distributions are normal. Furthermore, the conditional distribution of one variable given a value of the other is also normal. Much more can be said about the conditional distributions. The information about the conditional distribution of on is identical to the information about the conditional distribution of on , except for the switching of and . An example is helpful. Suppose that the continuous random variables and follow a bivariate normal distribution with parameters , , , and . The first two parameters are the mean and standard deviation of the marginal distribution of . The next two parameters are the mean and standard deviation of the marginal distribution of . The parameter is the correlation coefficient of and . Both marginal distributions are normal. The line is also called the least squares regression line. It gives the mean of the conditional distribution of given . Because and are positively correlated, the least squares line has positive slope. In this case, the larger the , the larger is the mean of . The standard deviation of given is constant across all possible values. With mean and standard deviation known, we can now compute normal probabilities. Suppose the realized value of is 25. Then the mean of is . The standard deviation, as indicated above, is 4. In fact, for any other , the standard deviation of is also 4. Now calculate the probability . We first calculate it using a normal table found here. Using a TI84+ calculator, . Note that is for the marginal distribution of . It is not conditioned on any realized value of . post in a companion blog. The post in the companion blog shows how to evaluate the covariance and the correlation coefficient of two continuous random variables and . It also discusses the connection between and the regression curve and the least squares regression line. The structure of the practice problems found here is quite simple. Given a joint density function for a pair of random variables and (with an appropriate region in the xy-plane as support), determine the following four pieces of information. where , , and . For some of the problems, the regression curves coincide with the least squares regression lines. When the regression curve is in a linear form, it coincides with the least squares regression line. As mentioned, the practice problems are to reinforce the concepts discussed in this post. For this problem, only work on the regression curve . Note that and do not exist.